Looking for a Houston, Texas team-building event, or a way to show appreciation for your employees? A fun change of pace for your next graduation party, communion or family reunion? We’ll bring our amazing Mobile Game Theater with our exciting video games and consoles for an event they’ll never forget! Houston’s mobile video game truck! 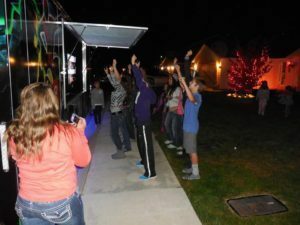 Outside dance party! We serve Houston and the surrounding Texas area with the best corporate entertainment, promotions, grand opening and customer appreciation events. We are also the ultimate entertainment for private parties of all kinds… graduation parties, communion, bar mitzvah and bat mitzvah, team parties and so much more!